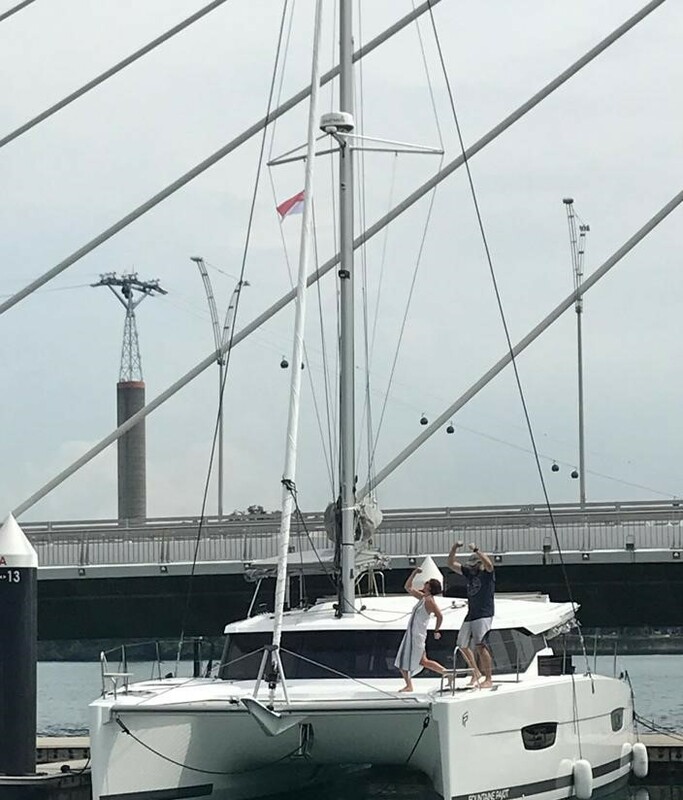 This was trip was part of the delivery of Double Cove, our new Fountaine Pajot Lucia 40, to Singapore. It had arrived 3 days earlier from France at the back of a large cargo ship. 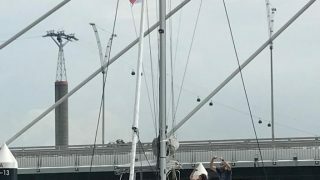 In those 3 days Multihull Solutions and the team from Happy Hut had been working really hard to get it all ready for our arrival in Thailand. We arrived late on Sunday 2nd December, so by the time we got to the dock it was already past 2030hrs and everyone had gone home for the night, but she was already looking in tip top shape and we were thrilled to see her for the first time. 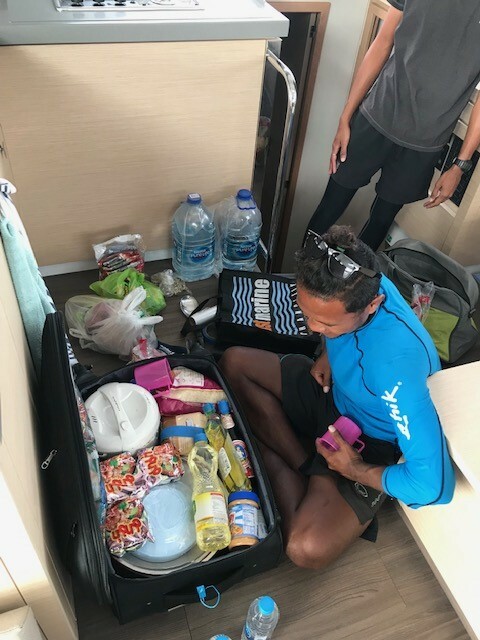 Monday (3 December) was spent with more washing, cleaning and preparing for sea trials by the Happy Hut team, whilst Andrew from Multihull Solutions patiently talked us through every little aspect of our new boat and us taking copious amount of notes. Tuesday morning we met for the trials and with a nice 10-15 knot wind. 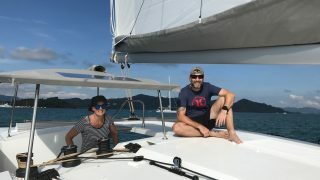 We had a great 3 hours trip experimenting with all the sails and sail configurations in the Phang Nga Bay. All went well and we were set for a 1700 departure that night for the delivery to Singapore. We could not hide our excitement. 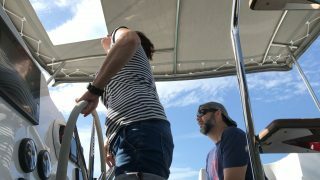 While the team from Happy Hut were more than capable to deliver the boat without us, we thought this was a great opportunity for a decent shakedown cruise, and to really learn the ins and outs of the boat from people who are very familiar with it. 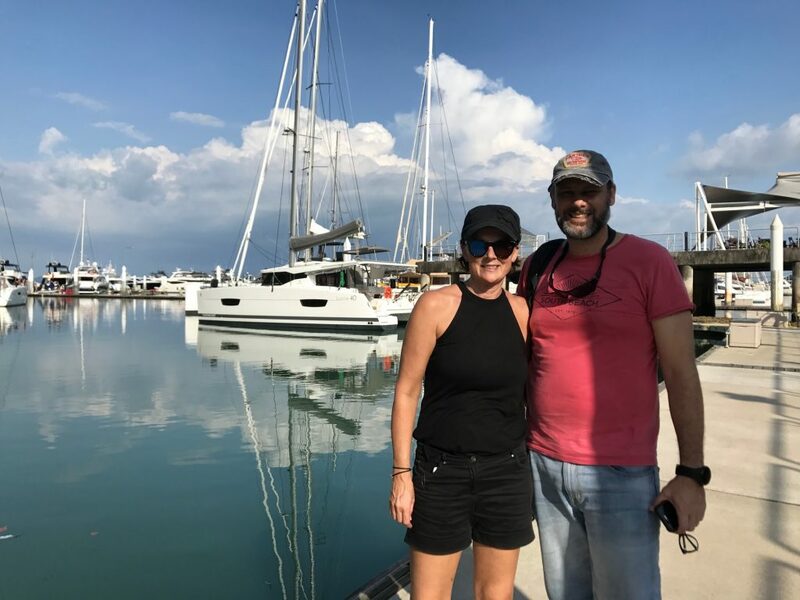 It was actually the farthest either of us had ever traveled on a yacht, and we were both very excited and a little nervous about this first trip we would not have missed this for the world! 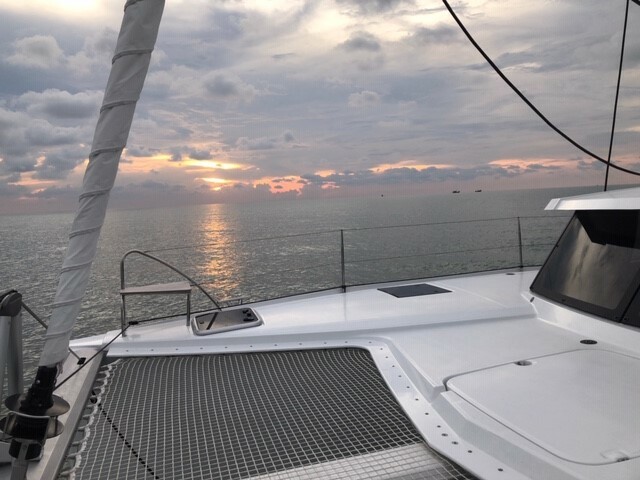 We had a perfect shakedown cruise where we got the opportunity to test all different kinds of weather… After the pleasant start with good breeze and calm seas, the wind gathered speed as did the waves. Not long into our trip we got the opportunity to see how our new boat performed in rougher seas. 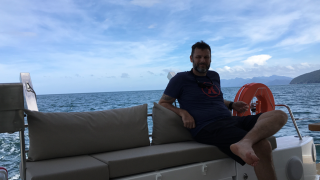 Whilst we would have preferred a softer start to our new lifestyle, it was comforting to see that the one who struggle most was us (Bodil tends to get a bit seasick…) and not the boat! Double Cove could not have gone better. 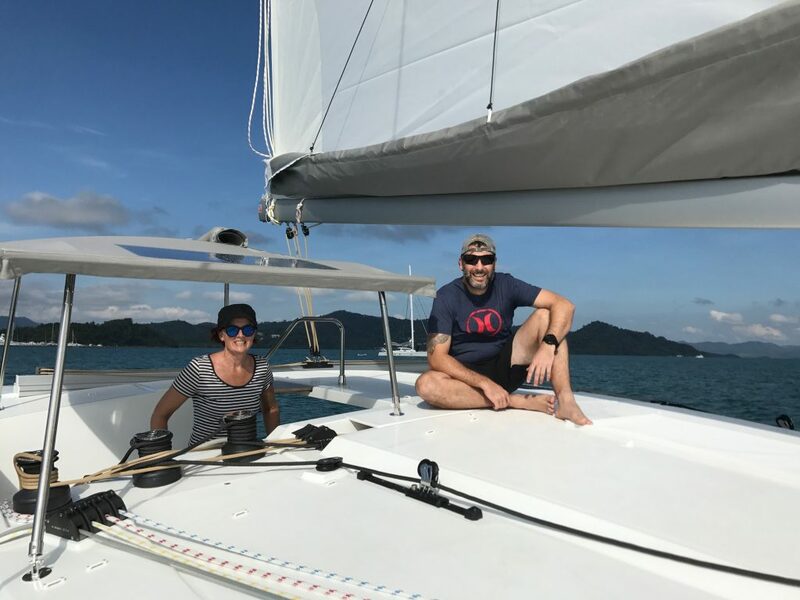 With motor (it was a delivery trip – not a pleasure trip), mainsail with two reefs and the genoa out we did just over 10 knots through the first night. The first leg was 18 hours to Langkawi, where we topped up the fuel which would take us non-stop all the way to Singapore. 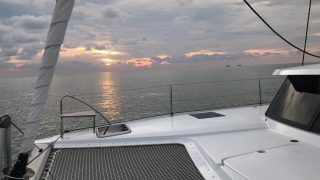 We woke on the first morning to a stunning day about 4 hours from Langkawi. 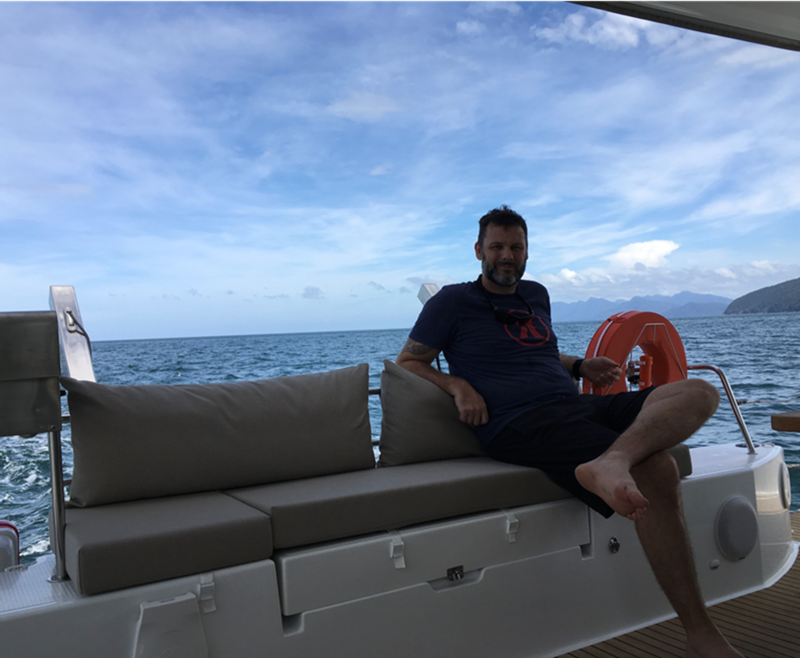 During breakfast we cruised the coast of Malaysia and pulled into a small marina for the fuel top up. 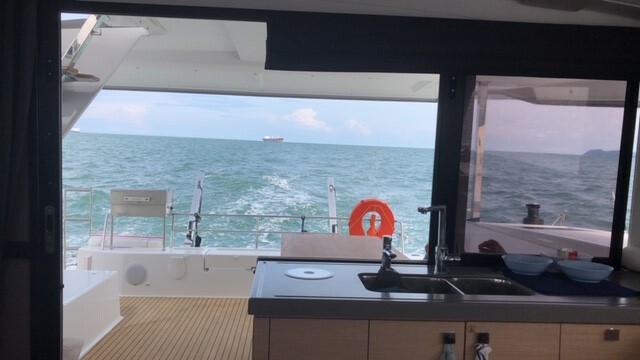 We had some lunch in the peaceful anchorage and at about 1400HRS we headed back out for the 60HR, 360NM journey to Singapore. The wind and waves picked up again and under reefed main and full genoa we made great speed down the coast. The waves were on the port quarter which gave a bit of rolling motion, but Double Cove powered through (Bodil was gaining her sea legs as well). A couple of big squalls hit us that evening and the crew had some wet hours on the helm with only the radar to guide us as visibility dropped significantly. But late in the evening it cleared and we continued our way south. For the remaining time the seas calmed down and the sails were only used occasionally when we had periods of wind . 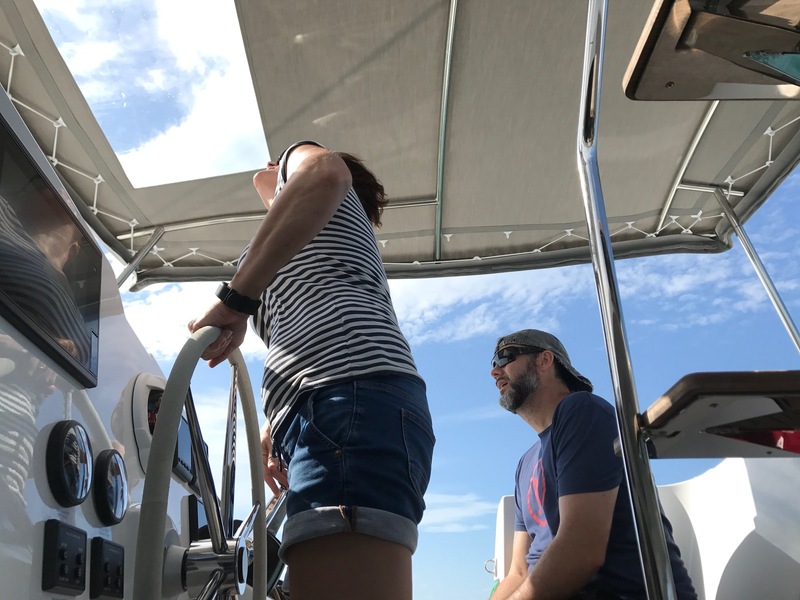 We motored along in lovely weather enjoying being on the ocean and one or two glasses of rum (we were sailors now, after all…!). On the 4th night we entered Singapore port waters at around 0000. Immigration at Sister Islands was quick and we were finally docked in the marina at 0515. It had taken 84HRS to travel the 550NM. It was now 23 months since we signed the purchase order, and we were very excited and happy to finally get Double Cove home! This trip was a great start to our new life as boat owners. 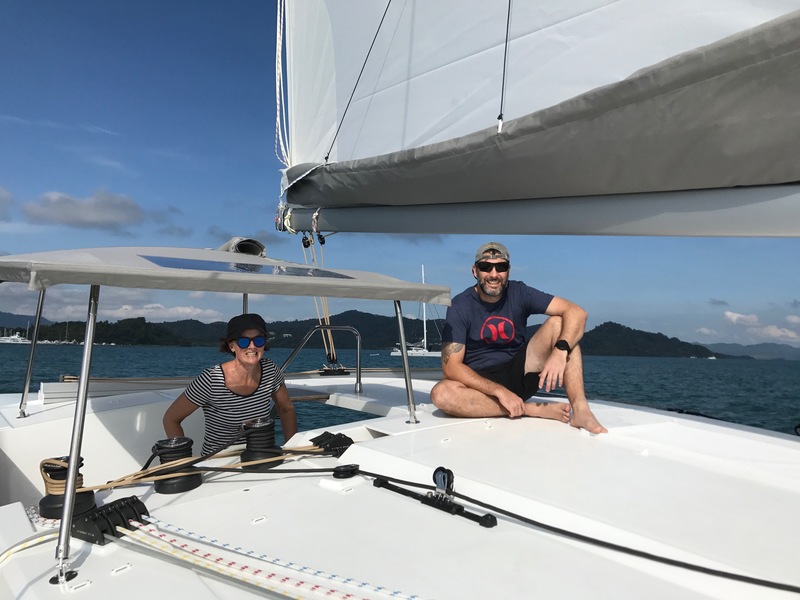 We were super happy with how she had performed on the way down, and felt confident that we had made the right choice of boat. A big thanks to Andrew de Bruin who supported us through the whole process from investigation to purchase to preparation and finally, the hand-over. His knowledge and expertise coupled with his calm demeanor made the entire journey stress free and seamless. Also a big thanks to the crew from Happy Hut. They showed a high level of professionalism and responsibility the whole journey. They even included us in all their meals so we had amazing Thai food the whole way to Singapore. We could not have asked for a better shakedown cruise and team to do it with. Next StoryWelcome to the Owner’s Club!